I tried to zoom in and refine the picture on the wall, but I still can't get a handle on what it is. A demonic clown? They are obviously in a bedroom; so, why would the man choose to sleep on the hard wood floor? Why is the woman's face cut out of the picture? Why is she standing while he sleeps? The man was sitting on the floor drinking coffee and playing solitaire. The woman in cowboy boots (an ex girlfriend? a jilted lover?) and her accomplice (the photographer) comes in and sets her Coke down on the chair and shoots him in the upper chest area. 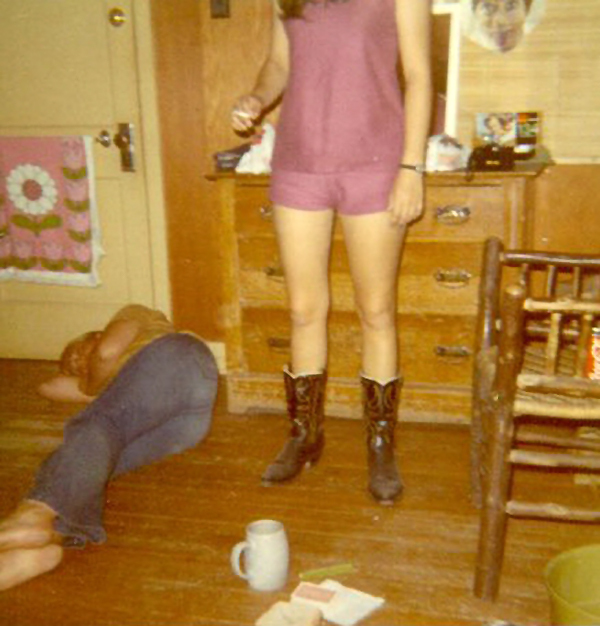 After the dirty deed is done, she lights a cigarette while her accomplice snaps a Polaroid - being sure not to take a picture of the murderess' face.... but being sure to get their calling card, the demonic clown, in the frame. I don't think it's the bedroom. Why would there be a bucket? I think he's asleep and she's probably sick of him passing out from drinking (that's a big mug). He wasn't playing cards, the deck in neatly ordered. I think it was a small party that died out when this guy rolled over and ZZZZed. The face on the wall I have no idea about. Nor can I tell what that green thing near the mug is. I'm guessing she and the clicker have something going. Not smoking a cigarette, I think, but holding a syringe. Something sinister is afoot. I think this is the last known photo for both these individuals. Lt. Columbo's on the way; he'll solve this! The cowboy boots are obviously to make footprints misleading. "No officer, I was in purple hot pants, of course I wasn't wearing cowboy boots!" They are in a very small apartment. The door has locks like a front door, but there is a dish towel rack on it, which means they are close to the kitchen. The dresser is in that room too, so it could be a sitting room for a small cabin (as suggested by the rustic chair, wood floor). There is a camera in the scene as well. The green thing on the floor struck me as a comb, but it could be part of the bucket, like a plastic handle. Is that a sandwich on the floor, too? Also, are we SURE that the person on the floor is male? Given how tight those jeans are, I don't think the rules of geometry would let you sleep like that "comfortably." It looks like a picture you could use for "KIM's game". It's a bedroom. On top of the dresser is a mirror, and the cutout face is probably some singer/actor who one of the girls' thinks is dreamy (even though we think he looks like a homicidal clown). He's somebody a girl wants to look at while she gets made up. I'm with nano - I think we're looking at two girls judging by the jeans, and a third holding the camera. It's a snapshot from a sleepover in Des Moines circa 1978.